Soldier especially doesn't aim, so hes view sight becomes wider and accuracy becomes very low. The quantity of shots defined by weapon. In this mode, there is no reason to shoot on long distance, only when soldier see enemy. Solder's view sight is regular in this mode, and fire accuracy much groves in difference of burst mode. Soldier speccially aims, by this, hes view sight becomes much longer, but more narrow. If soldier have a sniper riffle, this mode means to use the scope, in other modes it will not be used. In this mode weapon shoots single fire. To change shooting mode, soldier have to spend some of his TUs. This just makes the existing firing modes a little snazzier and time wasting. As for the scope, that would have to be coded in, unless you just say they use the scope. In which case that weapon has deadly aim anyway. Yes... you can get deadly aim. 70 Acc + Sniper Rifle = 120% to hit. Take in mind that's only true at a range of about 5 squares. Going over 40 or 50 it can miss entirely. ok, there is already 3 shooting modes, Auto-shot (burst), snap shot (single shot), and aim shot (aim mode). The calculations for these are already set and balanced...no need to make things more complicated to newbies. For me i think that the field of view of each soldier limits the gameplay ( scouts and shots from far ), soo i would sugest even bigger maps, tanks, jeeps, and a bigger line of sight making the "secure distances" by firepower not by "eyesight". Depending on the weapon fire distances, more tu spend. For example, you need to snipe enemy on long distance, so you will choose AIM mode, but when you are chosing this mode, you are don't see much thing that what happens close to you. So this is have 1 good thing and 1 bad. Good - you have more chanses to good shot and bad - You are easy target to enemy on close range. And scope on sniper riffle just will take you some longer range to view site in AIM mode in difference of regular riffle. And now you don't need to spend TU's for changing firing mode, from single to burst or other. So in this way you can say: "Why I need to spend TU's for changing weapon or reloading???". Any bigger maps will result in no minimaps. Let's try not to make the gameplay difficult...more tus to spend just because of distance will just downright kill xcom style battling. Too much change will result in non-xcomish battles...someone once said "too much realism will kill the fun. I do not like this idea one bit." Edited by Kratos, 03 August 2005 - 09:11 AM. Idea isn't to make maps bigger, it's to enlarge realistics in gameplay. 90% of idea already complete in X-com, but this thing with field of view and need to spend TU on changig modes of fire. About % to hit, I think that there has to be a maximum % of chance to hit, because always there is 1 chance not to hit target, so it can be 95% for example. "too much realism will kill the fun. I do not like this idea one bit." Soldier speccially aims, by this, hes view sight becomes much longer, but more narrow. In this mode weapon shoots single fire. I have a question, are we not liking xcom battles? i think the most important thing is to allow a free form tactic not scout, explosive, smoke, snipers all the time. I still defend the ideia of a major battlefield ... ALIENS TAKE OVER CITY HUNDREDS OF THEM STORM THE MALL FOR BUBBLE GUMS - "GRU NHUM TU KU CHU ... GRO JU CHU ..."
Translation : " We are here to kick human donkey and chew bubble gum ... and we are all out of bubble gum ... "
Edited by samsam, 03 August 2005 - 11:43 AM. the current maxium size is 60x60x4 for maps. Which is read as 6x6 in the game. Soldier limit can't exceed 15 as far as i seen. Not too mention you would run out of room on 640x480 screens. Edited by Neithan, 03 August 2005 - 03:59 PM. The Shadows are rising, soon all of you will perish! there are many more basic things to be sorted out before adding loads of features, or making any radical changes. And 200 units? Jeeps?? This is X-Com, not Battlefield. Whata flooders you are So, what do you think about my idea? I am for the ideia that the visual field of soldiers must be bigger, and then the aiming field could be your ideia. That's only a limit in UFO2000. I've had LOTS of soldiers on standard UFO. Actually it is even not a limit for ufo2000 engine (real engine limit is 32 soldiers per each player, but it can be easily extended to 64 if needed). 15 is the artificial limit added to put soldiers list on a single screen and also to prevent the users from abusing really big crowds. On the other hand original skyranger has 14 units limit. The Avenger can easily pack away 26 soldiers with no hassle. I say it might be a good idea to have the preset deployments (Skyranger; 14, Lightning; 12, Avenger; 26) but also allow for any other number should the players desire it. True, but 26 units on each side is not what I would call squad battle any more... and it takes too long. One could make it an option for private games, if people really want mass fights, but the online games should have a reasonable limit. Another idea about shooting modes. I'll try to be short. Currently we have 3 shooting modes: a quick single shot without much aiming, an aimed single shot that consumes some time, and a quick burst without much aiming. What is missing? An aimed auto shot. The problem is that: a single succeful aimed shot doesn't always ensure a kill; ussualy you can't make 2 aimed shots per turn; shooting burst at long distances without some aiming isn't rational (comp. games only). Here's also an idea about the TU it should consume. Example: The weapon needs 65% to make an aimed shot. 3-shot burst. The 65% of TU are those of the aimed shot (the soldier aims and fires the first bullet), and the 2x10% stand for another 2 projectiles fired by the soldier. Also it should be somewhat less accurate than a single aimed shot. So, the end effect would be to have 3 aimed shots for the TU cost of 1 and a half? I am slightly exagerating since you mention that the 2nd and 3rd shot would be less accurate. But this isn't really necessary because you can duplicate this effect with the Plasma Rifle. Its Aimed cost is 60%, Snap 30% and Auto 36%. The Auto Aimed would cost 96%, with the first shot of an 100% accuracy and the other two less (80 or 90%). But you can fire 3 snaps, total cost of 90%, with a 86% accuracy, which gets almost the same results. Undoubtely this fire mode would benefit most the Laser Rifle and Plasma Pistol since it would make them weapons with the same performance of the Plasma Rifle (3 shots at an 80 or 90+ accuracy). To me, "Aimed Auto" is the equivalent of standing still and firing three snapshots. It's a little unneccesary to have a seperate function. 5 vs 5 is a nice number, and makes games way more fun imho. you want different view distances and angles for soldiers. the idea behind this is of course to be able to snipe enemys without beeing seen yourself. this is something that can already be achieved. ive been beaten in a game today (even twice) where all the shots were coming out of nowhere. my opponent hat some spy somewhere close, but this one soldier did never fire a shot, not expose himself, and how much i tried, i didn't get him (in thought i even started to accuse my opponent of cheating). im sure he had maximum number of time units possible, and didn't carry anything or something like that. the shooting was done by the other soldiers, wich where further away and well out of sight for my own units. different view sights would only make sense if you play a single soldier. 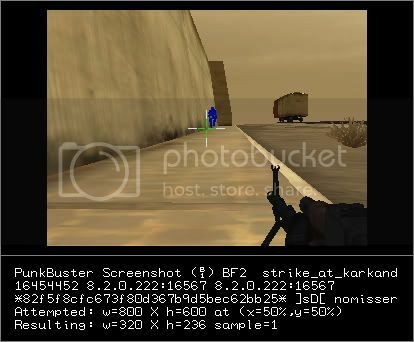 but if you play a team, that acts as a team, you could always set up your units in a way, that some wide-angled view soldiers, and some far-seeing soldiers stand close together, to get the benefits of both view modes at once (since the soldiers with short view still can shoot at enemies they dont see themselves), without suffering the drawback. Edited by Llyr, 09 December 2005 - 05:01 PM. Hobbes wrote: "So, the end effect would be to have 3 aimed shots for the TU cost of 1 and a half"
The starting idea was like this: you aim once and release a burst of three shots; in game it would mean that you fire an aimed shot and then fire two more projectiles without aiming (because it was already done). The first shot (aimed shot) has its full accuracy rating, the second suffers an accuracy penalty, and the third suffers even more penalty. Angry Lawyer wrote: "To me, "Aimed Auto" is the equivalent of standing still and firing three snapshots. It's a little unneccesary to have a seperate function." Now here comes the tricky part: a snapshot consists of a) minimal aiming and B) the shot itself. The auto shot consists of a) minimal aiming and B) three shots in a burst. The aimed shot consists of a) minimal time needed for the best aiming possible with the current weapon and B) the shot itself. The aimed auto shot consists of a) minimal time needed for the best aiming possible with the current weapon and B) a burst of three shots. Now, why do you have to aim poorly and shoot poorly thrice (make three snap shots), when you can aim once as best as possible and then shoot three projectiles in a burst? A snapshot is a reaction shot, you don't have to aim much you just draw your weapon and shoot. It's not rational to use it at large distances (in game that is). The main difference between three snapshots and aimed auto shot would be that you can shoot three different targets with three snapshots, when aimed auto shot is used only on one target and can hit adjacent enemies only by accident. I have came up with a simple formula to calculate the accuracy of second and third shots. I will try to duplicate the effects of aimed auto shot by messing with the weapons.LUA and compare the results with other shooting modes in game. I will post the results and maybe the statistics (average accuracy, total shots, hit and miss etc...) here. Edited by Leimrei, 10 December 2005 - 10:06 AM. Now, why do you have to aim poorly and shoot poorly thrice (make three snap shots), when you can aim once as best as possible and then shoot three projectiles in a burst? thats a if-you-see-Kayin good question! why would you use aimed shot, when you can have an aimed burst shot? why would you use auto shot, when you can have aimed burst shot? why would you use snapshot (except the case you dont have enough tus for anything else) when you have aimed burst shot? wouldn't it make more sense to use aimed shot + snap shot then? single shot slightly better acc than autoshot + single shot same acc than auto shot + single shot slightly worse acc than auto shot. why do we ne predefined shot-type combos? Edited by Llyr, 10 December 2005 - 11:07 AM. In cases when I don't have enough time. In cases when I want to have some spare time. Aimed Burst = Aimed Shot TU + 2x autoshot TU : 3. Do you use the snapshot when you can use the aimed shot? I know you do so you don't have to answer. Yes, it would be good to get rid of pre-defined shot types and move to Jagged Alliance style system. However I don't like how the burst mode is implemented there also. Edited by Leimrei, 10 December 2005 - 12:29 PM. Edited by Kratos, 10 December 2005 - 01:22 PM. Ideas are always welcome, just not all will be accepted. Keep those ideas coming though! Then I should stop thinking and go make some new weapons graphics. Allright I'll be a pain in the soft place a little more longer. Here are are the calculations of 2nd and 3rd shots, and the formula. Data from the shooting range will be available a little more later. The concept behind the weapons is not to have their accuracy greatly increased: you can do that by creating your own weapon set and setting their accuracy as you like. This Aimed Auto mode besides being unrealistic doesn't add anything necessary and would most likely make all other fire modes useless. The only way I'd see it getting implemented is if it only existed on certain weapons, like a flag you set in the LUA file. Still, it's MEGA overpowered, along the lines of having an explosive attachment on the plasma rifle. I don't like the idea of aimed bursts because they are not that accurate in reality. The only place I can see an aimed burst even being a possibility would be with the pistol class of weapons where aiming can be a little quicker. Weapons that do not have auto shot capability should also not have an aimed burst shot capability in my opinion. how about 30 soldiers ?? and time limit 3-5 minuteS?? only move some soldiers per turn. other willbe in safe place like in old x-com. in craft or some other place. tanks is also good idea!! I prefer we left it the way it is. Takes long enough IMHO. It may get harder/easier in certain situations to kill a unit later on in development, so it's best not to tamper with it right now until officially decided.